Truck bed-cap company A.R.E. 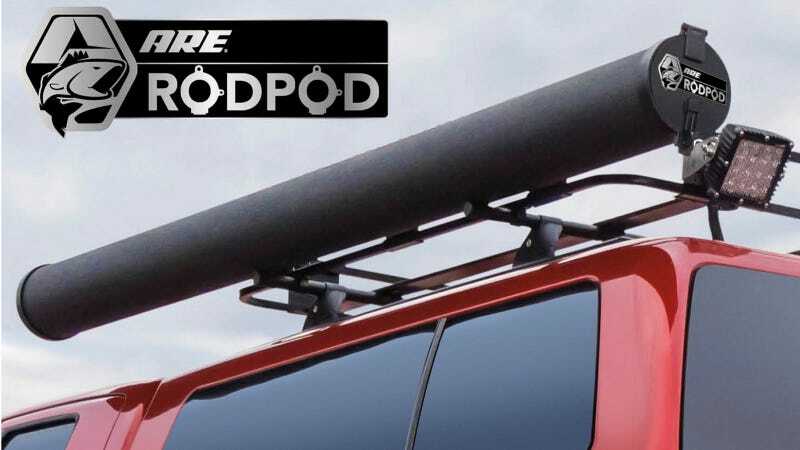 is diversifying its lineup of cargo accessories with the "Rod Pod," a plastic tube that holds (you guessed it!) fishing rods. They want $495 for it, and at that price I'll go ahead and spend three hours in Home Depot trying to make my own, thankyouverymuch. "Constructed with durable PVC plastic and corrosion-resistant stainless steel hardware, the Rod Pod is eight feet four inches long and six inches in diameter, and can comfortably accommodate a number of rods. A spring-loaded end cap can accept a padlock to protect the rods stored inside, and the unit is protected by textured black LINE-X elastomeric coating for long-lasting good looks." There's no doubt it's cleaner than what you'd probably end up with if you made it from plumbing parts, but is it worth the ask? Anybody got a better idea for fishing-rod carrying technology?